Boat Trader website visitors increasingly continued to shop for boats on mobile devices during the last year and this report drills down to the operating-system level. Regardless of the system, the report shows that the number of unique monthly visitors varies with the season from a high in July to a low in November and December. Our graphic depicts the 15-month period through October 2016 and reflects the seasonal variation of traffic patterns at the site. The No. 1 operating system visitors used during the period was the increasingly popular Apple iOS, which powers iPhones and iPads. 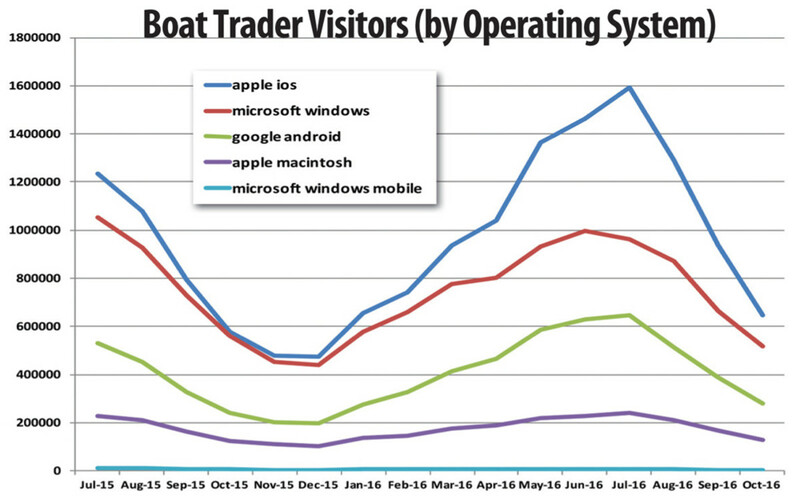 In July 2015, 1.2 million unique visitors used iOS to reach Boat Trader, and in July 2016 the number increased to 1.6 million. In the fall and early winter of 2015-16, Microsoft Windows usage nearly matched iOS, but since then the gap has grown, reflecting mobile’s gains and a slight decline in the use of PC-based systems. The Google Android operating system ranked No. 3 during the period, consistently ahead of the Apple Macintosh system, and it, too, continued to grow, peaking at slightly more than 500,000 visits in July 2015 and nearly 650,000 the next year.